The current release focused on helping especially the new users to get into the game. After registering a new user the tour starts immediately. The tour explains all the most important parts of the game and lets the user make first steps. You visit all important pages with explanations of the most important parts. Just enough to give you all the information that you need to start. It can be finished after some minutes. It's always possible to stop the tour by clicking on the Exit button or by clicking the x in the upper right corner. You can always resume or redo the tour at any time. Everyone can choose the way that fits the best. The most difficult to grasp concepts, terms and UI elements got clickable in-game help. To put all the help into the game is an on-going progress. At its end the wiki won't be needed anymore and the external forum too. The in-game help is a step towards that goal. Wherever you see that small round i button you can click it to open the in-game help for further information. After clicking the explanation help text pops up. 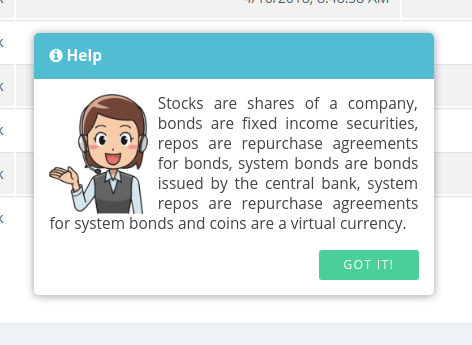 Not only were in-game help popus added, some pages got explanatory texts as well. 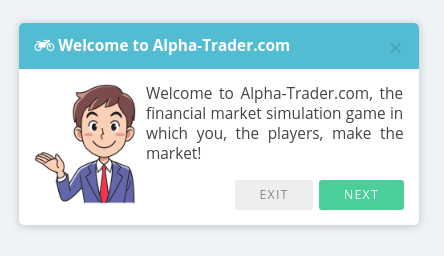 The market filters got a makeover to deal better with the enormous amount of securities that we already have in the market. Some UI bug fixes were made as well as some performance optimizations. 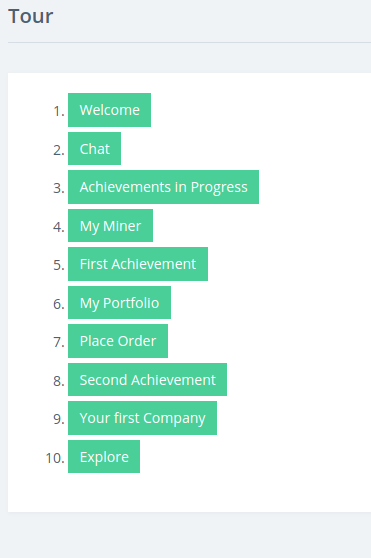 New chat messages are highlighted in the sidebar now. There is a highlight for new polls that you have not cast any votes in yet too. The average buying price is calculated based on your orders. Be aware of that sometimes securities get into your portfolio without trades. For example when founding a new company, becoming CEO of a spare company or when a bond defaults. 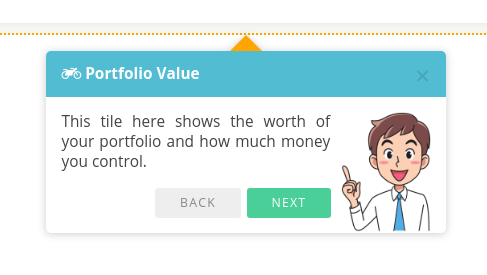 There is a new button in every portfolio position.